Sound! Euphonium is utterly fantastic. In a glance, it may look like just an anime that caters to band geeks (I know it did for me, shame on me I’m awful), but it’s actually an astonishing amount more. From characters to visuals to musical direction, I can’t seem to find a single aspect that this show doesn’t nail. A funny, charming, heartwarming, inspirational, down-to-earth show, Sound! Euphonium delivers in a variety of ways, all while giving a subtle, delicately framed view of the human condition. What it means to be special, what it’s like to just fit in, and what it takes succeed as a group and as an individual; Sound! Euphonium has a firm grasp on its themes and loves to smack you in the face with them from the very beginning. The moment the instructor first walked in, he put it up to a vote as to what their goal as a band would be: To make it to Nationals or to just have fun. This of course is a trap, because no one wants to feel left out. The ideal thing to do here is to want to succeed, as defined by the society we live in. Now that they’re tricked into aiming for the top, the class must learn what it takes to reach Nationals. Time, effort, and the determination to commit both of those two things. Most of the class finds the will to push forward in a sense of not wanting to let each other down. And that sense is acutely taken away when auditions are introduced. This is where those who don’t want to fail are separated from those who want to succeed. This is where our characters must find their own reason for progressing. Being around others makes you want to improve, to keep up with those around you and not be left behind. Because when you’re alone, the feeling of content will stand in your way. And competition only adds to this divide as the mentality changes from keeping up with each other to surpassing each other, leaving those who feel inadequate in the dust. With only a few major plot points, the characters of Sound! Euphonium are what really move the story forward. A festival, an audition and an end goal are the only significant points in the story that come to mind. The festival shakes up the relationships in a much more meaningful way than expected, having the Hazuki-Shuuichi romance as a playful misdirect and setup for Kumiko and Reina’s moment on the mountain. It’s here that we get a much more insightful look into who Reina is as a person. The audition is a place for Reina and Kumiko (and everyone else but mainly these two) to prove themselves, and complications arise that manage to bring Reina and Kumiko even closer together. The “complications” are brought up by students, further illustrating their control over the story and where it leads them. The charming playfulness of the characters shines incredibly bright, and I suspect you could tell even if there was no dialogue whatsoever. Every little movement depicts some sort of emotional response or state, be it the way Hazuki’s eyes widen in her awe of playing music in a group for the very first time, or how Kumiko always wears her discomfort on her sleeve. All their actions tend to be cute in some way, but the show never overreaches in an attempt to be “moe”. Even the running animations add to their sense of character, and every character seems to run in their own specific way. The attention to detail in Sound! Euphonium is outstanding. Be it the shine of the instruments or just hair blowing in the wind, sweat dripping down a characters neck or faces turning red after long sessions of continuous blowing, and the accurate finger placement pushed in sync with the music. Sound! Euphonium is an absolute joy to behold from just a visual standpoint. And the backgrounds are very pretty as well. Now let’s talk about my two favorite characters, the first being Reina Kousaka. She’s a cool and stoic individual who’s incredibly smart and skilled, and just all-around a person to strive to be more like. “I don’t try to get close to people who don’t interest me.” Kousaka doesn’t waste her time with formalities and appearances like most other students. She knows that “being relieved to know you’re the same as someone else is stupid” and so she strives to be someone different. What makes her special is the fact that she wants to be special. She doesn’t pretend to be perfect because she’s actually trying to become it, and it’s this determination that puts her above everyone else. Reina acts somewhat cold around others because they mostly don’t interest her, and she wouldn’t want to waste her time on them. Luckily, she has Kumiko Oumae, who was once the epitome of going along with the flow. Kumiko is the one person Reina can be herself around, and because of that we’re allowed to see this other side of her, a side that speaks about some serious issues within our society and then laughs it off mere seconds later to the absurdity of someone actually saying that out loud. Even when it comes to confrontation, Reina manages to keep her cool, but rather than bottling up rage, she just saves it for later, yelling to herself or to her confidant, Kumiko, in a cute an endearing way. It’s this side of her that makes her real, and truly likable as a character. Asuka Tanaka, while still being likable, is sort of the opposite of Reina, being warm and approachable on the outside, cold and spiteful on the inside (I assume). She’s absolutely hilarious when we first meet her, and a little less so nearing the end of the season. I like her upfront and somewhat standoffish behavior, as well as her enthusiasm and sense of humor. “I’m Tubacabra. You were born to blow me.” Her wit and confidence in delivery just blew me away. Plus, sexual innuendos are always funny. Other than her outwardly appearance however, we don’t get to see much of what Asuka is like when she’s alone. There are hints at something being hidden deep down, but I’m afraid this season we didn’t get to delve into what really makes Tanaka tick. But that’s probably just being saved for the second season, and I think like we’ve received more than enough Asuka to hold us over until then. One last note on the music, I quite enjoyed the selection in this season. None of the musical pieces felt contrived or uninteresting, but that may have just been due to my lack of experience with the genre. In relation to another musical anime, I will say that Sound! 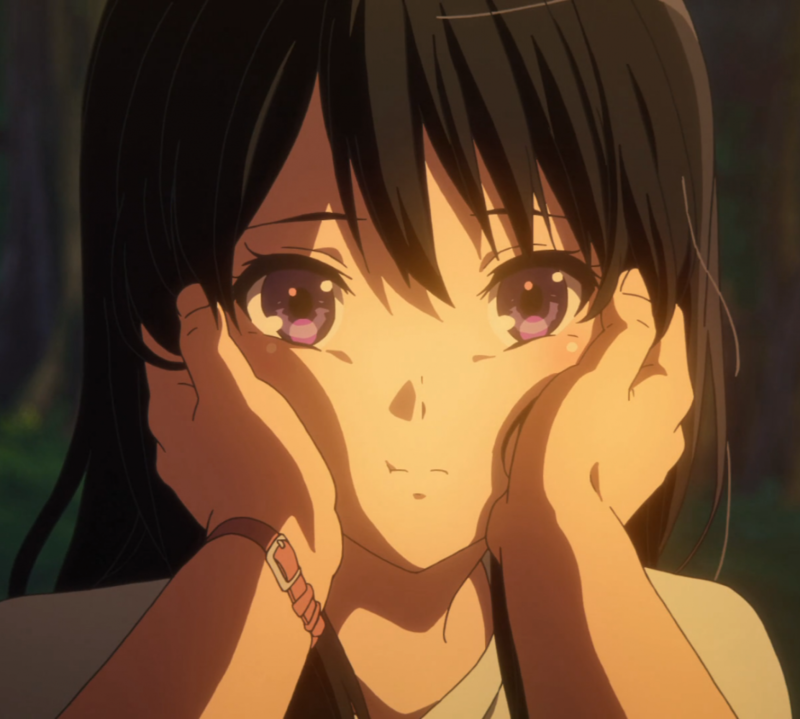 Euphonium is a lot less about the music than Your Lie In April, which is great because it makes the show much more relate-able to broader audience. Sound! Euphonium is loosely about enjoying music with your friends, and it hits on much harder themes that can resonate through many walks of life. I loved Sound! Euphonium and can’t seem to find any reason to dislike it. In every single direction this anime is fantastic. It’s seemingly just a show about a school band trying to make it to Nationals, but it manages to do so much more with such a small premise. Sound! Euphonium avoids hackneyed themes and conclusions like “the power of teamwork”, and instead goes for something more real, subtle and thought-provoking. Sounds like a sweet anime to watch one day. Thanks for sharing your thoughts on this. Ah! This series has been repeatedly recommended to me. I still haven’ watched it yet. One of these days. . . one of these days. I’ll watch this, so I won’t feel out of place reading reviews about how awesome it is. Anyway, thanks for sharing this post to my blog carnival. Keep on watching anime and blogging. Cheers!